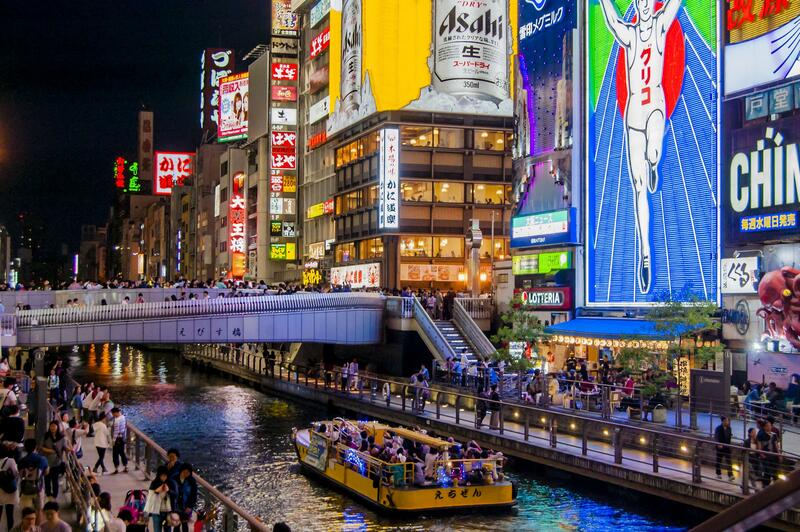 Osaka was formerly known as Naniwa, which was Japan’s first recorded capital; it has since become Japan’s third most populated city with almost three million inhabitants. Located 250 miles west of Tokyo, at the mouth of the Vodo River on Osaka Bay, Osaka is the economic centre of the Kansai region. So distinct and culturally proud are the residents of Osaka, that they speak their own dialect of Japanese called ‘Osaka-ben’. Many of the words and phrases that you will hear along the streets will be completely unique to the city. The city has two main centres: Kita, the business sector of the city, and Minami, which consists predominantly of shopping districts and parks. The city is teeming with monuments of ancient times including Osaka Castle, which is a faithful reconstruction after the castle tower was struck by lightning in 1665. Historically, Osaka was also instrumental in the development of Japanese education; many of Japan’s finest scholars, who went on to strongly influence the development of Japanese culture, were educated in the city. The nickname, ‘the nation’s kitchen’, originates in Osaka’s history, as essential goods including rice were shipped from the city to the rest of the country and the world. Although rice is not the main export today, Osaka’s economy is still prosperous. In Mastercard’s rankings of world centres of commerce, Osaka was placed 19th; thus demonstrating its relevance in today’s world market. The city has many renowned universities with superb research facilities. The Intelligent Robotics Laboratory at Osaka University is at the forefront of its field, and is just one example of the developments that universities in Osaka are giving to the world.